Have You Ridden the Train Lately? I have. With a footprint from Raleigh to Greenville, SC and 36 offices and 1400 REALTORs to visit, I have been taking advantage of the train service from Raleigh to Greensboro to Charlotte to Greensboro to Raleigh on a regular basis. When I tell people I ride the train they are always shocked and then usually comment about their desire to take the train more often. When I tell people I ride the train they are always shocked and then usually comment about their desire to take the train more often. “I was working in my yard a few years ago and noticed that the previous homeowner laid black plastic down on the ground around the foundation. I knew this was a major no-no when trying to keep insects away from your house. You are providing insects with insulation and a weather barrier of protection from Mother Nature’s controlling reach. A piece of Toyota technology is making Allen Tate open houses more accessible than ever. Last weekend, we unveiled our new Open House ad in the Winston Salem Journal HomePlace insert. In the right hand corner of the print ad you’ll find something that looks like a barcode. What is it you may ask? Well, that square looking barcode is called a QR code and is a two-dimensional code that is readable by dedicated QR barcode readers and camera phones. There has been a lot of buzz recently about the marriage between real estate and QR codes…and for good reason. 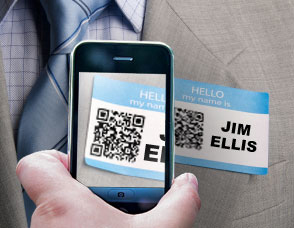 If used correctly, QR codes are a great asset for those in the real estate industry. Charlotte is in the Spotlight! Charlotte, North Carolina – Home of the 2012 Democratic National Convention! Who would have thought … five, ten years ago, that this could even be a possibility? Politically, we will let the pundits discuss why Charlotte was selected over St. Louis. I would like to look at it from the perspective of where Charlotte has been and where Charlotte is going. Charlotte would not have even been in the Top 10 to qualify for such a large event, had it not been for some tremendous public-private partnerships to set the stage many years ago. Corporations, government and private individuals worked hand-in-hand to create an environment that will put Charlotte in the spotlight for years to come. You could say (as it relates to travel and tourism) that Charlotte has arrived! So the pundits and talking heads are busily analyzing the relative merits of Pittsburgh, Pennsylvania vs. Green Bay, Wisconsin. Apparently, there is some big competition looming between the two cities. Not one to miss a good debate, I thought I should weigh in. As an Allen Tate, REALTOR®, I have access to a wealth of tools because of our affiliation with the Leading Real Estate Companies of the World®, a major real estate network comprised of the best locally and regionally branded residential firms. (Our network sells $250 billion in homes annually, more than any national franchise brand.) Among those tools is Onboard Informatics, a valuable resource for Allen Tate clients and our associates who need to research and compare communities. I was taught at a very young age that being a good listener is just one of the keys to success. As an Eagle Scout, I learned that part of having a good rapport with someone is being able to have a TWO-way conversation with them. The importance of your words is complimented by the focus that you give to what the other person is saying. As a freshman in college, I learned from my chancellor, along with other campus leaders, that I could strengthen my relationships with people by returning the conversation — by keeping the ball in the other person’s court. I am a lot of things — but handy is not one of them! I am the idea creator but I fall short when it comes to implementation. Lucky for the people in my life who end up taking these projects on, I am an excellent gift giver and a savvy shopper. The headlines jumped out at us in 2010: “Head of Scandal-Ridden NC Highway Patrol Resigns” “Misconduct at NC State Bureau of Investigation Forensics Lab” “NC Examines ABC Boards’ Ethics Policies.” In this era of scandal, corruption and unethical behavior, it’s good to know that all Allen Tate agents are REALTORS®…meaning we pledge to a Code of Ethics that is among the most comprehensive of any industry. Allen Tate agents support ethical conduct which obligates us to the obvious: respect for the public and respect for the properties we represent. But our Code extends beyond that. Respect, courtesy, and trust for our peers in the business is paramount to our success, our ability to cooperate fully with one another, and the positive image of the professional REALTOR®. It is officially awards season: the Golden Globes, the Grammy’s, Screen Actors Guild and the Academy Awards. From the red carpet to the grand finale, we eagerly anticipate our award show of choice to see what outstanding entertainment performances will be recognized. As excited as I am about starting a New Year, which kicked off with the birthday of Grandmaster Flash and the Tournament of Roses Parade (I tuned in for North Carolina Central University’s Marching Sound Machine), I’m even more excited by the debut of a new Offer to Purchase and Contract form in North Carolina. Created jointly by the North Carolina Association of REALTORS® and the North Carolina Bar Association, the revised Offer to Purchase and Contract (NCAR® Standard Form 2-T, 1/2011) was written to eliminate many of the problem areas that led to contractual disputes between Buyers and Sellers.